Collectability of the State Quarters and a first year of design to the Jefferson Nickel support 2006 US Mint proof set value. Five set options were offered by the Mint in 2006, each valued differently and listed on the chart. Identity of each set is detailed with images and descriptions. Each coin in these sets is struck in proof quality a distinctly different minting process. The coining dies used to strike the coins are highly polished and the devices - design and lettering - are given a frosted finish. Special treatment to the coins extends to the blanks prior to striking. An added step of high polishing to the metal insures the quality of the proof surface of the finished coin. Of primary consideration is condition of the proof coins within the set. Grading and confirming the coins are in original Gem Proof condition adds confidence in the value. Examine the surfaces of the coins under a single light source. Gem grade is described as no spots to the surface, note the cent and nickels both carefully. Hazing of the mirror fields should not be present. Finally, inspect the rim area of the coins in contact with the insert, no discoloration affirms the Gem Grade. Additional inspection of the packaging is needed as collectors consider it as part of value. Corners of boxes are not crushed, tabs are intact and no markings on the packaging indicating gentle handling is well received. In 2006 the proof set representing the circulating coins of the day featured 10 different coins. Housed in two plastic cases are the cent through dollar in one case and five State Quarters in the other. 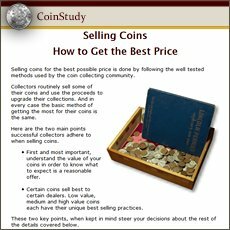 All coins are the same metal alloy as those used in daily change. Inserts within the cases separating the coins feature a waving US Flag in light to deep blue colors. White stars are upper left with "United States Mint Proof Set" text over the US Mint Seal in the center. Case containing five State Quarters features text in white "United States Mint 50 State Quarters Proof Set" over the Seal. Reverse designs of the cases are a solid blue color insert. A white US Mint Seal is printed within the cent through dollar case and the fifty State Quarters logo printed on the insert of the quarter set. An outer cardboard box to fit the two plastic cases is white overall, illustrated with an upper view of the Statue of Liberty shaded in blue. Blue stripes with white stars trim the top and bottom edges. Blue lettering describes the set and date - 2006. Also, to complete the packaging a folded Certificate of Authenticity card further describes the set and gives metal content and dimensions of the proof coins. A separate option was available to obtain the five State Quarters as a single set in 2006. 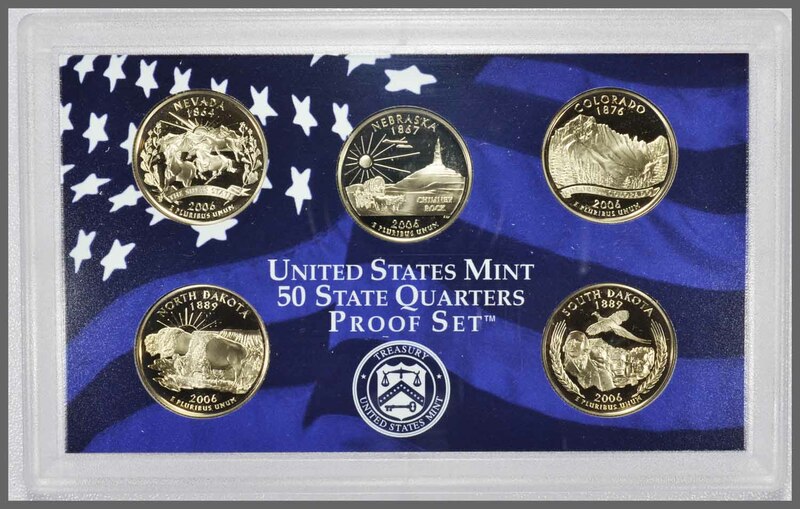 These five quarters are displayed in one plastic case featuring the same blue flag image used in the expanded proof set. An outer box protects the case printed with a Bald Eagle image in shades of blue. Blue text identifies the State Quarter proof set with the date 2006 in a silver color. Reverse of the outer box is a map of the US states in gloss silver with the states within the set highlighted in a matte silver-grey. Confirm the folded Certificate of Authenticity is included to complete the set and packaging. Silver alloy of the dime, half dollar and the five State Quarters enhances the value of the 2006 silver proof set. Cent, nickel and Sacagawea dollar are the same alloy as circulating coinage. Two plastic cases display the 10 coins. Cent through dollar in one case featuring a red toned US flag with white stars and lettering identifying the silver version of proof coins. Second plastic case houses the five State Quarters of 2006. Each is separated with an insert matching the cent through dollar case. Exception is the text "United States Mint 50 State Quarters Silver Proof Set". Outer box is also considered part of the set. Printed in tones of red the upper part of the Statue of Liberty, lettering identifying the silver version of the set and a blue US Mint Seal. Included is a folded Certificate of Authenticity giving details of the silver composition within the coins. Underlining value just representing the silver within the coins: 4/22/2019 | $20.06 . Collectors of the silver version of the State Quarters had a separate option in 2006. 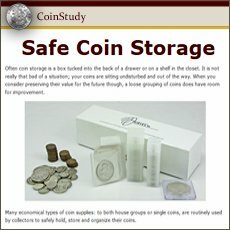 Five 90% silver State Quarters in one plastic case could be purchased separately. This silver set option was popular and housed the state quarters in a case matching the one of the 10-coin set. An American flag graphic in shades of light to dark red highlighted with white stars forms the background printed on the insert. White text identifies the special silver version of the quarters. Individualized outer box is in shades of silver-grey color, sized to fit the one plastic case. Image of a Bald Eagle is set with light grey text and the date 2006 in gloss silver color. Reverse of box, a light to dark grey US flag is the background to the US states map highlighting the states of the quarters minted in 2006. Certificate of Authenticity is included stating "Silver Proof Set". This set forms an important sub-set within the State Quarters series because of the 90% silver alloy of the coins. Base silver value: 4/22/2019 | $13.55 . Brilliant luster, mirror fields and frosted devises are gem qualities to coins. Confirm this level of preservation to the surfaces. A deluxe proof set was offered to collectors as the 2006 American Legacy Collection. All ten proof denominations from the cent through Sacagawea dollar and the five State Quarters. Also, two 90% proof silver dollars; the Benjamin Franklin Founding Father and San Francisco Mint Silver Dollar. Two plastic cases house the proof coins representing circulating coinage. The current 2006 five proof State Quarters are in one case featured against a black insert. A second plastic case displays the Lincoln cent, Jefferson nickel, Roosevelt dime, Kennedy half and Sacagawea dollar. All are the same alloy as business strike coins. A black insert within the plastic case displays the coins with no printing on or within either case. Two silver dollars are mounted individually in plastic capsules. Benjamin Franklin is celebrated with the "Founding Father" silver dollar. Noted is his accomplishments and a recognition of the tercentenary of his birth - 1706. Second silver dollar is an image of the San Francisco Old Mint. Reverse is the iconic design found on the Morgan silver dollars. Both silver dollars are 90% silver and represent a sold base to value both in metal content and collector demand. These two rectangular cases and two round capsules with the proof coins are displayed in an elegant tray with fold out panels. Each panel describes the two commemorative silver dollars. A collapsible stand houses a pocket with the Certificate of Authenticity. An outer sleeve featuring the Capital in silver outline on black houses the complete set. Nevada State Quarter celebrates entry to the Union in 1864. American sprit and the beauty of Nevada are depicted in the design. Wild horses are well detailed and high in profile portrayed running. Framed either side with a border of sagebrush. The level of detail within the sagebrush shows both well-defined leaves and flowers rendered. In the background is a dramatic mountain range, the Mint press release described the range as "snow-capped mountains". The large sun rays are dramatic. The official state nickname "The Silver State" across the ribbon defines the economic importance the discovery of the silver played in the growth of Nevada. Nebraska celebrates its pioneer spirit on the State Quarter. Entry to the Union in 1867 is part of the upper design. An ox-drawn covered wagon is pictured in the foreground in route to settling the western US. The 1860's was a time of settler's expanding to Nebraska encouraged by land grants from the federal government. Prominently depicted is the Chimney Rock formation. Its location and visual impact as a landmark signified to pioneers the location of "Where the West Begins". 2006 located under the design is the year the quarter was minted. Proof sets of the State Quarters became available in March of 2006. With a panoramic view of the Rocky Mountains finely detailed as the design, the state quarter celebrates "Colorful Colorado" as its theme. Deputy Mint Director David Lebryk expressed Colorado's rainbow of beauty and color is the "purple mountains majesty" of the anthem - America the Beautiful. Within the design are detailed and defined pine trees along the slops and ridges. Colorado's diverse terrains with its deserts, canyons and grasslands includes the dramatic Southern Rocky Mountains. A colorful landscape. At the top of the quarter - Colorado 1876 - denotes entry into the Union. 2006 at the lower rim is year the coin was struck. Two American Bison grazing on the large expanses of North Dakota's grasslands are in the foreground of the State Quarter. Grasslands in North Dakota are part of the Great Plains region providing huge areas of grasses and shrubs. The sunset view of the design includes in the background the terrain of the Badlands. Known for the arid climate and absence of vegetation, a typical butte of the area is engraved in high detail. These buttes, rock formations the result of erosion, are distinctive with their flat tops and steep sides. North Dakota is depicted well by designer Stephen Clark. Included in the design is - 1889 - dated at the top, the year North Dakota entered the Union. Below the Bison - 2006 - is the year the State Quarter was minted. Presenting a theme of honoring four of the nations greatest leaders, the immense Mount Rushmore sculpture fills the reverse of the South Dakota State Quarter. Opening ceremonies, the day these quarters were released was held at the base of the monument. Giving the presentation newly instated Director of the Mint: Edmund C. Moy referred to the dramatic backdrop as fitting and a classic tribute to the four leaders. Minute detail of the engraving portrays Presidents George Washington, Thomas Jefferson, Theodore Roosevelt and Abraham Lincoln. Mount Rushmore National Memorial in South Dakota, taking 14 years to carve into granite became an iconic symbol of America. Portrayed in finely engraved detail is a Chinese ring-necked pheasant South Dakota's state bird. Completing the design are wheat stalks, symbols of the agriculture wealth of the state. Celebrating entry to the Union - 1889 is dated above and 2006 notes the minting date of the quarter. 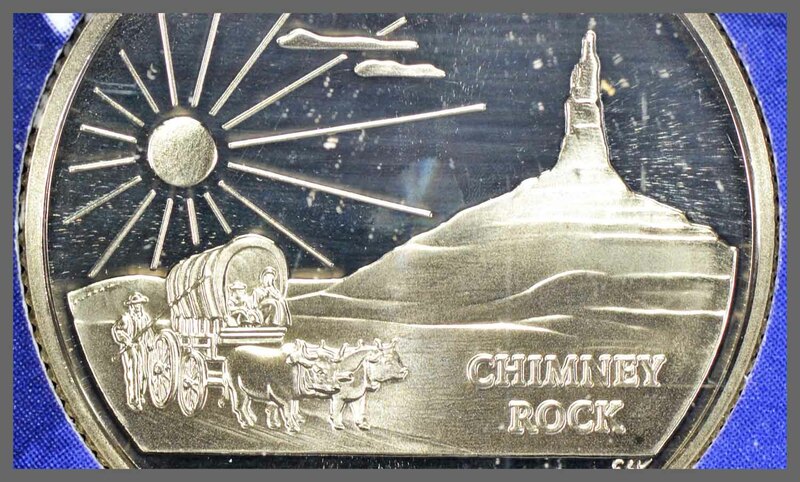 "Chimney Rock" a natural formation fills the background of the design on the reverse of the Nebraska State Quarter. The design is rendered in a frosted, softly detailed view. Chimney Rock is a towering (445 feet from the base) landmark well known to pioneers and settlers along the journey to the west. Its size is captured well in the design. In excellent detail is the covered wagon pulled by oxen. Minute engraving is seen in the small details of the wagon, boards to the sides of the wagon, ribs holding the cover and spokes to the wheels. The pioneers are recognizable as a lady and young child seated on the wagon and the man walking along side holding the guiding pole to the oxen. 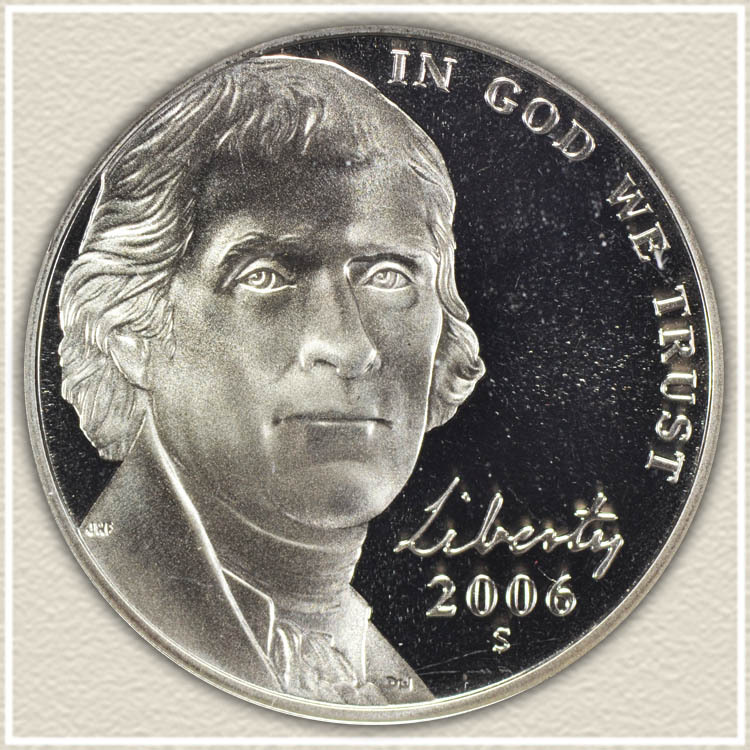 2006 marks the introduction of a new design of the Jefferson nickel. Obverse portrait of Jefferson is now in a forward-facing view. Highly detailed and compelling, Jefferson fills the left with "Liberty" in Jefferson's on handwriting over the date - 2006. The new "Return to Monticello" nickel completes the Westward Journey Nickel Series and establishes the design of the nickel going forward. 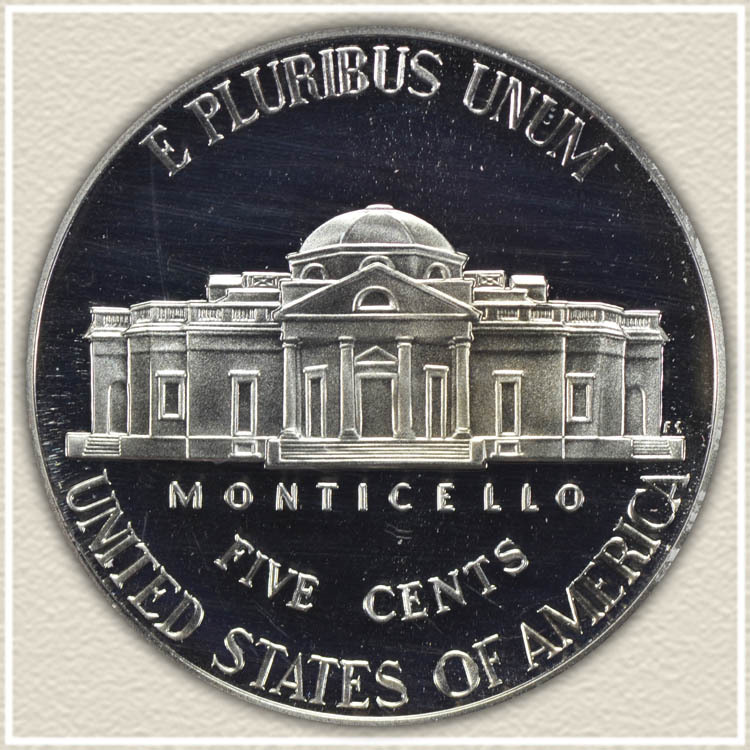 The reverse of the nickel sees the return of the Monticello design. However, slight changes and enhancements were introduced. The dome was refined with minute structural details. Details to the railing of the upper balconies are now recognizable. Further details around the doors and windows are stronger, adding depth and dimension. With its high mirror finish to the fields and frosted design elements the proof version of the new nickel is quite distinct. Additionally, to further confirm the proof version, the "S" mintmark (indicating the San Francisco Mint) is just under the date. Continued interest in the State Quarters series assures a steady demand. An impressive display of designs has developed with each additional coin issued. Proof sets featuring State Quarters minted in 90% silver are very popular with collectors. Certainly adding value to these proof sets is the new US nickel design beginning in 2006. A "first year of issue" status is important and sought by collectors. Combined with the enhanced qualities of the proof striking the coin's collectability is assured. Proof coin annual set values listed starting with the 1955 set. Each year one or more distinct set options were issued by the US Mint. Each listed separately as to value and details to identify your set and judge its overall condition. Refer to images and descriptions to determine the specific set and unique value. Unique properties as to grade and mintmarks; each described and imaged within the series. Surprising value is found in the smallest of detail.